On January 1, 1985, Michael Harrison, son of former Vodafone chairman Sir Earnest Harrison, made a call using the Transportable Vodafone VT1 as Vodafone pipped BT Cellnet to make the first UK mobile phone call. According to the operator, Michael Harrison secretly left his family’s home just before midnight to surprise his father with the call, which was made from Parliament Square in London. As Sir Ernest Harrison answered the phone, Michael said: Hi Dad. It’s Mike. This is the first-ever call made on a UK commercial mobile network, according to Vodafone. Wise had dressed in Dickensian costume and entered St Katherine’s Dock on riding on a 19th Century mail coach. He also called Sir Ernest Harrison, although there is no record of what was said between the Morecambe and Wise comedian and the Vodafone Chairman. The network had been competing directly with BT Cellnet in a race to become the first network to make a mobile call in the UK. Cellnet, now O2, launched its service on January 10. The Transportable Vodafone VT1 which the Harrisons used weighed 4.7 kilos, the equivalent of 36 iPhone 6 devices, and cost £1,650 – £4,600 today when taking in to account inflation. Vodafone began selling mobile phones before Harrison had even completed the first call, with more than 2,000 orders made before the end of 1984. 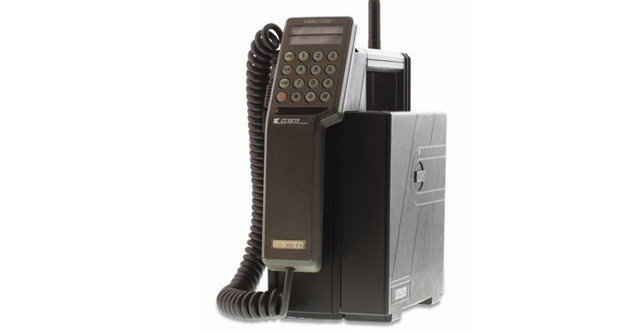 By the end of 1985, over 12,000 devices had been sold. Vodafone started with 100 base stations to service its UK customer base, but now has 11,000 base stations serving its 19.668 million customer base (as of end of November). Vodafone Group Chief Commercial and Operations Officer Paolo Bertoluzzo said: At launch, the founders of Vodafone targeted British business executives, sales representatives, journalists, doctors and veterinary surgeons.